What is cold and snowy on the outside and warm and tropical on the inside? – You guessed it – the Writhlington Orchid houses. No school today as we have around a foot of snow lying from 20 hours of pretty much continuous snow from 6pm on Thursday to 2pm today. 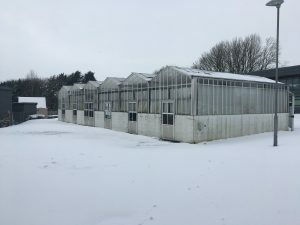 There was no way to make it to school from Frome so massive thanks to Rosie, Issy, Jess and Gareth who treked through the blizzard to check the greenhouse and water this morning. Photos to follow. Well done Issie, Rosie, Jess & Gareth! Greenhouse Superheroes.